If you drink beer then you will be familiar with Saccharomyces cerevisiae a species of yeast with a penchant for sugar. If you drink beer then you will be familiar with Saccharomyces cerevisiae a species of yeast with a penchant for sugar. With beer that sugar is derived from malted cereal. Yeast is a magician that creates alcohol from sugar through the process of fermentation. Fermentation (from the Latin term ‘fevere‘ – to boil) is a maelstrom that results in alcohol, carbon dioxide, and heat. There are three tribes in the beer family – Ale, Lager, Lambic – and the major difference between them is the strain of yeast the brewer uses for fermentation. Ale brewers employ Saccharomyces cerevisiae a cultured yeast which ferments quickly adding fruity, sometimes spicy aroma and flavour to beer. Lager brewers use a hybrid cultured yeast strain called Saccharomyces pastorianus evolved from Saccharomyces cerevisiae and Saccharomyces bayanus. It ferments slowly and contributes a crisp body to the beer by fermenting more of the sugars in the wort than ale yeast does. Lambic brewers do not use cultured yeast instead utilising airborne microflora that land in open fermenters and spontaneously ferment the brew. 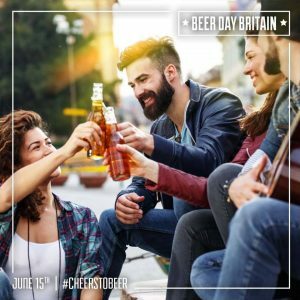 Some of those spores are a strain of wild yeast called Brettanomyces (translated from the Latin for the British fungus) and along with other organisms that live in the local atmosphere give the beer a tangy and sour character more akin to cider or wine. With ale and lambic beers up to half the aroma and flavour comes from yeast and quite often it is these characteristics that drinkers respond to, and the reason why they might prefer one brewer’s beer over another’s. Many ale brewers will have a house yeast that they have used for decades and it is the equivalent of a fingerprint for their beers. Fermented foods and drinks are more nutritious than their non-fermented versions so raise a glass to yeast for converting water, malt and hops into a libation that bestows so many benefits.